Conquer the White Mountains and immerse yourself in the beautiful views of New Hampshire. 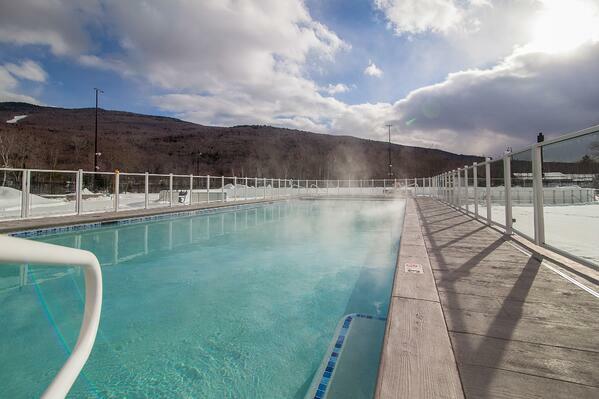 There is nothing short of extraordinary about the RiverWalk Resort at Loon's pools. There are actually 2 different pools and 2 different hot tubs, not counting the soaker tubs in your suite, of course. Both pools are heated. The lagoon pool is scheduled to open Memorial Day weekend, weather permitting. The upper deck pool actually starts inside and then expands outside. The water is heated to the perfect temperature year-round so that you are always comfortable, regardless of the weather. Walk down the steps into this heated pool inside, sneak through the faux wall, and outside without the water ever changing temperature. The walkway around the upper deck pool is also heated, so that your toes can stay comfy, even in the winter when you make your way out to the outdoor heated hot tub. This crescent shaped hot tub can soothe around 12 people at a time with the jets taking away most of the pressures of your adventurous day. The large outer lagoon pool has a nice slope from the far end in toward the center where it gets to be 5 feet deep. The shallow end is where you'll feel comfortable letting that toddler splash around. In the middle, is our cauldron fountain, which fires up at night as the water spouts spray out in all directions. In the winter, check out what we do to make this pool into a state of the art skating rink! Inside, look for our indoor hot tub. Large, deep, hot and oh-so relaxing. This tub also has an amazing view of the mountains through the floor to ceiling glass windows.